Thinking Local is a new monthly series that examines the reasons why thinking and buying local matters to Portland's economy and neighborhoods. It's no secret that Neighborhood Notes loves local—we're not shy about professing our support of local coffee micro roasters, new locally owned businesses, or even neighborhood-specific honeys. And while it's fun to share the love for local artisans and indie business owners—those idea people and creators that define us as Portlanders—there's an even better (economic) reason why thinking local is important. Now, you may be thinking that you've heard this too many times before or want to stop us right here because you already subscribe to the "movement." Or, maybe you don’t believe that buying local really affects our economy that much. 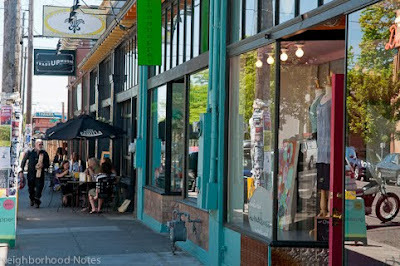 But Neighborhood Notes would like to take a closer look at some of the reasons why thinking and buying local matters to Portland's economy and neighborhoods. From supporting small businesses to strengthening community involvement, our Thinking Local series will touch upon topics like job creation, local investment, environmental issues, opportunities for youth and more, while showing how you, the consumer, have power in your dollar. Because, when you spend your money at locally owned businesses, you're also making an investment in your neighborhood and the local economy. Why Should Consumers Buy Local? "A much larger share of the money that you spend at a locally owned business stays in your local economy and supports a much larger number of local jobs," says Stacy Mitchell, a senior researcher at the New Rules Project, a program of the Institute for Local Self-Reliance that aims to "bring fresh new policy solutions to communities and states to ensure that they are 'designing rules as if community matters.'" "Eventually that dollar you spend at a local business comes back around to you in the form of more jobs and opportunities locally," she continues. "Studies have found that if you spend a $100 at a national chain store, only about $15 stays in the local economy. If you shop at a locally owned business, studies show that, depending on the type of business, anywhere from $30-50 out of every $100 you spend stays in the local economy. So you get two to three times the economic benefit without spending any more money by just choosing a locally owned business instead of a chain." Read the rest on Neighborhood Notes.